For privacy-conscious users, Incognito Mode has long been a favorite feature of Google Chrome. It lets you browse the web without maintaining a history or saving information like cookies and form inputs. Other browsers have tended to call it Private Mode, since that's probably a term more people are familiar with, and it looks like Google might be planning to go down that route too. A couple of tipsters have noticed that the 'Open in incognito tab' option when you long-press a link has been changed to 'Open in private tab,' which could signal that Google is about to change things up for everyone. I've checked on every version of Chrome for Android (Stable, Beta, Dev, and Canary) but they all still read 'incognito' for me — so this is probably a limited server-side test for now. It's not unlike Google to test potential changes like this with a small number of people before deciding what to do, so there's still a chance things will stay the same. The Chrome Help page already references 'private' quite heavily, so that could be a sign of things to come. 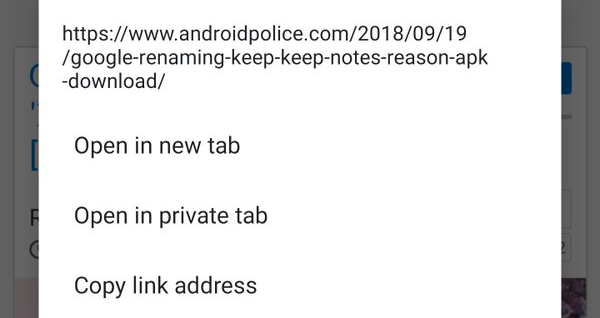 Add this to the recent change of Keep to 'Keep Notes' and it seems Google is intent on renaming things for greater clarity. Turns out that an entry in the Chromium bug tracker from a couple of months ago talks about changing Incognito to Private in some countries to see if usage increases, so that's clearly what's going on here. Hopefully, they'll decide to stick with the terminology we're all used to.